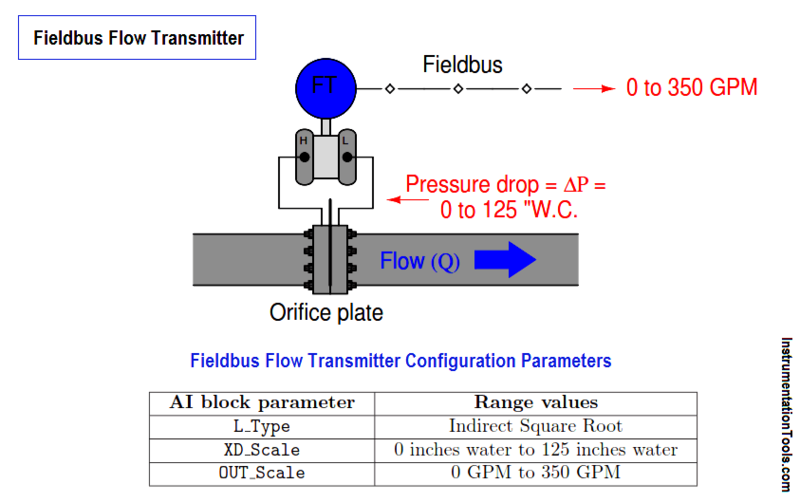 Fieldbus transmitter ranging application, this time a diﬀerential pressure transmitter sensing pressure dropped across an oriﬁce plate in order to infer the rate of ﬂow for ﬂuid inside the pipe. The transmitter senses small amounts of pressure diﬀerence (expressed in a unit of pressure called inches water column), but what we want it to report to the Fieldbus network is an actual ﬂow rate in gallons per minute. This particular non-linearity is unique to pressure-based measurements of ﬂuid ﬂow, and does not ﬁnd application in any other form of process measurement. As before, though, we see a common theme with the XD_Scale and OUT_Scale parameter ranges: we set the XD_Scale parameter to the physical range of measurement directly sensed by the transducer, we set the OUT_Scale parameter to the corresponding range of measurement we wish the transmitter to report to the rest of the control system, and we set L_Type to “indirect” to enable this translation from one range to another.